Press Release: Redefinition of the SI unit kilogram: Everything is Different, but Nothing Changes - METTLER TOLEDO's new White Paper explains why. 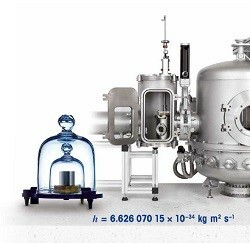 You are here:Home Press Releases Press Release: Redefinition of the SI unit kilogram: Everything is Different, but Nothing Changes - METTLER TOLEDO's new White Paper explains why. In May 2019, revised definitions of four of the base units of the SI will come into force. The redefinition of the "Kilogram" ensures a stable definition for the unit kilogram. However it also calls for explaining the background and benefits of this revision. METTLER TOLEDO is helping users to understand it better with a free White Paper "Redefinition of 1 kg". The kilogram will be defined in terms of Planck’s constant and calculated on the basis of specified fundamental constants. This will guarantee long-term stability of the SI mass scale and eliminate the technological barriers inherent in the current system. The kilogram was the last measurement unit of the International System of Units (SI) to be defined by a man-made physical body, namely an artefact. However, the problem with this definition is that this physical body, although intended to have a stable mass, actually changes its mass over time. Since this body itself is the reference for all mass measurements, this change cannot be determined by any measurement. This major reexamination of the SI since its foundation in 1960 may be perceived as ground-shaking to the weighing world. However, the goal of this redefinition is to ensure long-term stability and traceability of the unit for mass by making it independent of the material artefact, without affecting calibration or measurements. METTLER TOLEDO delivers a new White Paper based on expert knowledge to help customers find out more about the reasons, methods involved and benefits of redefinition of 1 kilogram.